Wishing you a new year filled with happiness and joy. Let’s welcome the new year with this easy yet yummy and healthy sweet. Grind the raw rice, coconut and cardamom together. The ground mixture should be coarse. Cook the moongdal with enough water. Make sure the moong dal is not mashed and add the ground mixture. Meantime, powder the jaggery, add water till it immerse and bring to a boil. Add the jaggery syrup to the dal and stir well. Let it boil once and switch off. Heat the ghee and fry the cashews and raisins till golden brown and add it to the kheer. Serve hot. 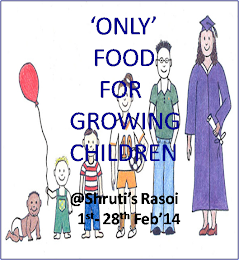 Sending the entry to only food for growing children at shruti's rasoi started by Pari. FoF. Simple theme. Powered by Blogger.